I didn’t go into this contest expecting my job to be easy. But when I’m sorting through quantities of photos, focused on choosing the perfect shot to complement accompanying text or to illustrate a certain design point, I’m used to having just one image jump out at me as the perfect choice. So then it would just be a matter of choosing a runner-up or two, right? I have to cringe when nursery customers dismiss grasses as looking “too weedy.” How sad that they can’t appreciate the beauty of these graceful plants in a natural setting, as so beautifully shown in the photo (right) by Jean of DigGrowCompostBlog of grasses at Davis Mountains State Park in southwest Texas, let alone the many ways that grasses shine in gardens. Healingmagichand’s entry showcases a variety of grasses forming dramatic vertical accents in her Petite Prairie at The Havens, while the shots of ‘Morning Light’ miscanthus by Christoper of Outside Clyde, Linda of An Artist’s Garden, and Janet at Queen of Seaford (with bonus butterfly) emphasize just one popular grass’s distinctive form and texture. Grasses also have a way of adding the appearance of movement to a planting, as in the mixed planting with Mexican feather grass (left) captured by Pam of Digging and the cascade of purple fountain grass by Susie at Poppy and Sage. Combine a variety of grasses with different heights, textures, and forms, as Craig at Ellis Hollow did, and you have a border that’s both high impact and low maintenance. Gradually, gardeners are beginning to appreciate plants that look as good after bloom as they do while in full flower, and ornamental grasses are some of the most gracefully aging perennials around. James at View from Federal Twist shared a glorious shot of ‘Cloud Nine’ switch grass in its golden fall glory (right), and Melody treated us to her daughter’s lovely composition of seedheads shown off by the autumn colors of nearby trees. It’s the outstanding winter presence of grasses that excites me most, though, and their tenacity is well captured in a mid-January shot of porcupine grass and switch grass by Debbie at Garden of Possibilities. Maybe it’s my winter bias that influenced my top two choices, but hey, I’m the judge and I’m allowed to have a bias, right? So, my pick for the Picture This Silver Medal for this category is the snowy scene of miscanthus in the garden of Yvonne at Yvonne’s Country Garden. And the Picture This Gold Medal goes to another chilly but surprisingly color-rich combination of grasses and conifers at Toronto’s Music Garden, submitted by Janet of Beautiful Botany. With images like this, who could argue that grasses are messy and weedy-looking? Another unfair objection to grasses that I hear sometimes is that they’re simply green and boring. The images we’ve already seen amply illustrate their beauty in the garden, but these plants also hold up on close inspection, delighting curious gardeners with the dainty beauty of their blooms and seeds. Little surprise, then, that a number of our entrants chose to get up close and personal with their grasses. Joco shared a breeze-tossed grouping of beautifully bleached seedheads, Jill-O took a good look at the intricate infloresence of northern sea oats, and Radhika of Native Again Landscape shared a stunning shot of quaking grass’s pearly seedheads (above), with the elegant addition of a beautiful butterfly. Miscanthus flowerheads and seedheads were an especially popular subject, and we were treated to various views by contest entrants, including Heirloom Gardener (of Miscanthus sinensis ‘Adagio’) and the Picture This Silver Medal winner in this category: Little Wing of Little Wing Garden, with a breathtaking shot of emerging flowerheads on the variegated cultivar ‘Cabaret’. Fountain grasses (Pennisetum), too, are amazingly photogenic in both bloom and seed, so there’s little wonder that several images appear among the entries. Those that seemed to fit best in this close-up category include a colorful leaf-and-flowerhead shot by Teresa of Gardening with Soule; a terrifically textural later-season shot of seedheads with panicle hydrangea by Raji of A Green Home and a Green Garden; and this category’s Picture This Gold Medal winner: the arching infloresences of purple fountain grass submitted by Phillip of Dirt Therapy. Grasses have a way of catching light that’s matched by few other plants – a trait skillfully captured by a number of this month’s entrants. Teza of Teza’s Garden caught a beautifully backlit clump of ‘Morning Light’ miscanthus (right); Jennifer of Kewee’s Garden showed off the stained-glass effect of Japanese blood grass; Town Mouse of Town Mouse and Country Mouse snapped the dancing spikelets of Stipa gigantea; and Frances of Fairegarden treated us to a spectacular shot of sunrise on the dew-laden plumes of pink muhly grass. Back-lighting shows up stunning details in closeups, as so beautifully shown by Caroline of The Shovel-Ready Garden in her shot of purple fountain grass, and by MacGardens in his image of green foxtail (left). The competition here was very close, but I did end up picking two here that really spoke to me. For the Picture This Silver Medal here, the light-filled image of Mexican feather grass by Philip of East Side Patch caught my eye. Several of this month’s images had some indefinable quality that put them into a category of their own, which I’ve been thinking of as “artistic.” I found the big-sky shot of zebra grass by Dave of The Home Garden remarkably dramatic, for instance, and the image of bluegrass seedheads with ironweed submitted by Marmee of Things I Love is more like a painting than a photograph. The depth, detail, and color of the miscanthus seedhead shot from Louise of Buddy Garden is simply wow, as is Sea Oats at Sunset by Meems at Hoe and Shovel. I ended up giving a Picture This Silver Medal to Nancy of Soliloquy for another amazing sunset shot with silhouetted seedheads, because the grasses were a more prominent part of the image. I snuck in another placement here, because it was so hard for me to choose between the final two. 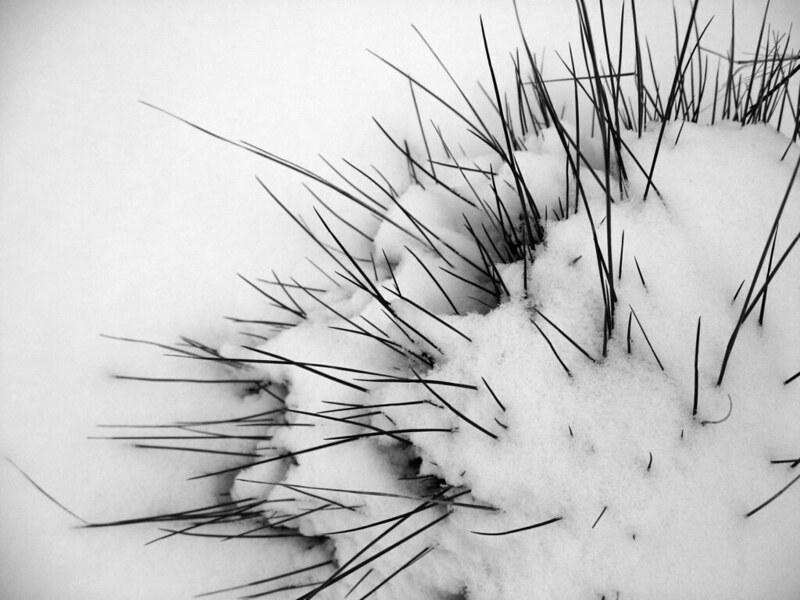 So, the second Picture This Silver Medal goes to the spikes-in-the-snow shot from Scott at Rhone Street Gardens. And the Picture This Gold Medal? I don’t think I can explain exactly why I love the shot of little bluestem and another grass submitted by Alexa of Invisiblebees so much. I just do. For the big finish, I separated out and compared the four gold medal winners. And out of those, I chose the one that I thought showed the very best that grasses can offer to the garden: light, color, texture, and movement. So, a big congratulations, and a collection of gorgeous grasses from High Country Gardens, goes to Phillip of Dirt Therapy for his exquisite shot of purple fountain grass. All of you who have been awarded a medal can grab the appropriate badge from this post and display it on your blog, if you wish. And, a big thanks to all who took the time to enter! Nan gardens on 4 acres in Bucks County, Pennsylvania. In the firm belief that every garden ought to have a pretentious-sounding (or at least pretentious-looking) name, she refers to her home grounds as "Hayefield." There, she experiments with a wide variety of plants and planting styles, from cottage gardens and color-based borders to managed meadows, naturalistic plantings, and veggies--all under the watchful eyes of her two pet alpacas, Daniel and Duncan. Thanks for your careful thought and analysis to choose among so many wonderful shots. Phillip’s capture is the best of the best. Congrats to him and all the others too. Well done. I don’t know how you mush through these wonderful images to come to your choices but I couldn’t agree with you more on the final choice. Yipeee…. If these pictures don’t change some gardeners attitude about ornamental grasses to the POSITIVE side of using them .. well I don’t know what would ! An absolutely perfect choice for first gold medal as well as all the others. Congratulations, Phillip (and Jamie and Randy). Entering this contest is a fun challenge and visiting all the entries is equally exciting. This one was especially enjoyable. It opened my eyes and gave me new perspective on grasses in the snow ~ which I only see if I take a vacation northward in winter. It would have been so difficult to judge all these marvelous grass entries. Many of your choices were my very own, too… but glad I’m not the judge. Thank you, Nan… that was a lot of work for you. Congratulations to Phillip! What beautiful photos from all the medal winners. Congratulations to all the winners. Those are awesome photos every one of them! Good job Phillip, Just love that photo. I would not have wanted to choose because they are all so great in their own ways. Makes you want to go out and get a bunch of different grasses right away! Thanks GGW for having such a fun contest so we can all get a better appreciation of what we look at in our gardens every day. Congrats to the winners, especially Phillip! There were many incredible images in this contest, Nan. It would have kept me up late trying to decide among them. You made great choices. what a visual treat this morning..many gold winners and ‘Best of the best is the best”..absolutely beautiful ..I would call this picture ..”happy dancing grasses”..congrats to all winners and they are all gorgeous..Nan you did a wonderful job,it seems you have been studying each picture thoroughly and your description in each category makes them even more beautiful. Thank you Nan & GGW ..I enjoy this event a lot. Wow, I’m thrilled beyond words to receive this Silver Winner for the photo I entered! So many gorgeous shots to choose from — congratulations to all the winners, and to all who entered the contest. i am so glad you were the judge and not me….i could not have narrowed it down to just a few awards. they were all so spectacular. it seems to me that the entries were so personal and represented a personal point of view….which makes it even harder to determine a winner. congrats to all the winners….especially the best of the best winner….philip. it is such a textural…lovely colourful shot. thank you nan for taking such a insightful look into the pictures. it was fun to be a part of this. Congrats to all the winners. So many beautiful shots entered, what a difficult choice. Phillip your shot was one of my favorites, just amazing! Thanks to Gardening Gone Wild for hosting this fun contest every month so that we can all see each other’s creativity. Wow! I had not seen all of the entries and I’m blown away to have been chosen for a Silver Medal. I would have had a very hard time judging this contest~ thank you so much for the opportunity and congrats to all of the winners. Amazing! I just love the many ways in which grasses can show off their beauty. What a great contest! Nan, you picked many of my favorite photos. I’m glad I got a chance to look at so many of them. I remember when I first saw Phillip’s that I thought it had one of the best chances to win. Congratulations to him and all the others. And thanks to you for doing such a good though difficult job! Grasses rock! Don’t you just love grasses! I enjoyed seeing everyone’s take on these wonderful plants and was glad I didn’t have to pick. Thanks so much for Gold Award on Lighting. Congratulations to all of the photographers, and especially to Phillip. I was so thrilled to receive the news that my photo was selected. I enjoyed entering and I want to thank Gardening Gone Wild for the contest. I always enjoy seeing all the entries every month! Thanks again! Congratulations to Phillip and all the medal recipients! What a difficult task Nan had of choosing the best from so many wonderful shots. Kudos!! All of these images are wonderful. Nancy, judging the contest must have been quite challenging, but your choices are spot on. Congrats winners, and great job everyone! Thank you for taking the trouble to do this and the great choices. Congrats to all the well-deserving winners! Congratulations to all the winners and thank you to everyone who entered. I greatly enjoyed viewing all your wonderful photos. Really great contest once again GGW, and I am polishing my silver award with Silvo as I try to write! So many entries, and such a well deserved winner…that shot was a grassy shocker Phillip! Congratulations. As always, an enlightening read through all the competitor entries. I look forward to the next competition. How many people on average are now participating in your competitions out of curiosity? Congratulations on your win! Your photo was magnifique. Feel free to grab the silver medal badge and display on your home. You deserve bragging rights. Copyright © 2007–2019 gardeninggonewild.com. All Rights Reserved.